Portfolio » Case Studies » Bosworth Interiors, Inc. Most online businesses start with an idea, and that idea leads to a website where the idea can take shape and show itself to potential customers. When Pat Bosworth had an idea for a website that would sell interior furnishings, the project needed a specific website design that would allow her business to transfer from design work done in person to an online business. Without a workable website that could accomplish everything online, Bosworth would have had to shut down her business and liquidate the inventory she already had. That's when she found Accessible Computing®. 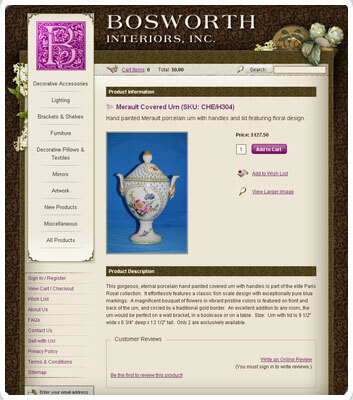 Creating Bosworth's website required not only a site that could feature the extensive inventory of a home interiors e-commerce site, but a shopping cart, a way to accept payments online and a tastefully-designed site that meshed well with the upscale home interiors theme. The resulting site built for Bosworth Interiors has made her online business possible. Customers can pay by credit card through the site and add as many items as they like to the shopping cart. The site is so easy to use it has made Bosworth a competitor of the big home interiors stores. There's nothing that the big sites can do that Bosworth's site can't. Each of her products has a simple magnification tool to allow customers to easily get a better look at her merchandise. One click brings up an enlarged view that makes the details of her pieces more apparent. There's even a wish list on the site that allows customers to mark the items that interest them and then to come back to that list later. And, in keeping with the current trend of placing customer reviews on e-commerce sites, Bosworth Interiors has that feature as well. Customers can write their own reviews of the products they buy, giving potential customers more information about the items. This gives customers a sense of security and confidence in the site as well as in the individual products. Since the site was created, it has consistently grown in traffic. According to Bosworth, each month that the site has been live the traffic has continued to grow. The business is well on its way toward supporting Bosworth as well as a new foundation she wishes to found. The success of the website has been the results of the collaboration between Bosworth and Accessible Computing®. The site was created in order to conform to Bosworth's vision of an e-commerce site that met all of her business' needs. While working with Christian at ACI, "he is always willing to do what it takes to meet your needs. He's open to listening, rather than forcing what he thinks you need," Bosworth said. "Christian is so positive, so happy - and that makes me stay positive, too. Makes my day to talk with him." Starting from scratch? Maybe you've got some ideas about what you'd like your website to do - maybe you're still in the process of learning what's possible. Accessible Computing® can help you create the online business that you're hoping for. Your first step is to request your Free Consultation.